His apology has garnered 29.2 million views (at the time of publication). And according to SocialBlade, it has already earned him somewhere between $14,000 and $116,000. Twitter is rightfully outraged that Paul has been able to profit off of a grave ethical mistake, and others condemned YouTube for allowing a platform where bad behavior is compensated. Some people demanded that he donate the proceeds from the apology video to charity. Paul is apparently taking a break from videos at the moment and has not responded to the reported monetization of his apology video. Logan Paul monetizing his apology video for uploading a vlog in which he laughed at and zoomed into a dead body, which he also monetized, just further proves how ignorant and money hungry he is. Some people do not deserve the success and platforms they have. this actually looks bad on Logan Paul AND YouTube because YouTube didn’t do anything. They didn’t remove it even after it appeared on their trending page, they didn’t put any strikes on his channel & they still let him monetize his apology video. 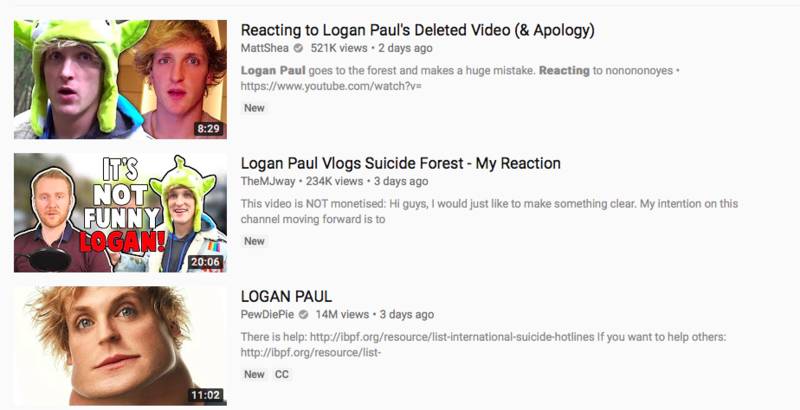 The entire YouTube ecosystems is a fraught one, with other YouTubers uploading their own “Logan Paul Reaction” videos and in turn making money off these clips. It’s one thing for Paul to have a lapse in judgment with taking and posting the original video, but it’s another thing entirely that he’s able to profit off this mistake. At this point Paul has not suffered any major setbacks professionally or financially for posting the original video — if anything, this incident has made him more money. Hopefully YouTube steps in to adjudicate: our larger fear is that in a culture where videos clicks drive profit, others may see a “YouTube scandal” as a big payday with little personal consequence.